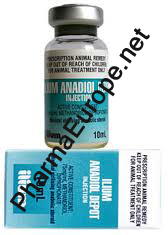 5-Anadrostenediol - designed to dramatically increase levels of testosterone in the human body. The substance 5-Androstene-3B, 17B Diol is a hormone precursor that has a direct one-way conversion into testerone in the body. What is this compond? 5-AD is actually the demethlated version of the schedule III anabolic steroid Methandriol. This substance is about as close to an anabolic steriod as you are going to get and still be allowed to purchase without a prescription. Is 5-AD Safe? So far users have not reported any side affects from the use of Anadiol-50. As with any nutritional supplement however, it is a good idea to consult with your doctor. What should I stack with 5-AD? Anadiol-50 and Millennium (19-Norandrostenedione) is the ultimate stack. Users have reported a synergistic effect when using both 5-AD and 19-NOR at the same time. Some users have reported as much as a 60% increase in effectiveness of the 19-NOR when adding 5-AD at the same time. How much should I take? Users are reporting Great results when using 200mg to 400mg per day. Most atheletes are taking 100mg of 5-AD and 200mg 19-NOR on training days and 50mg 5-AD and 100mg 19-NOR on off days. A high quality product from USA Health Products, available at fine Health Stores & Gyms. WASHINGTON- President Clinton's top drug policy adviser announced June 26th that "within a few months" androstenedione ("andro") may be classified as a steroid. There are four tests that determine if a substance is a steroid. So far, andro has met three of the testing criteria. The fourth was not met, but apparently, the government will keep testing until that happens. According to Dr. Tim Ziegenfuss, director of research and education at Pinnacle ( a division of Bodyonics) there are actually four tests-three to determine if a substance is a steriod, a fourth which determines if it is anabolic. So far, andro has tested positive for the first three: it has a molecular structure relative to testosterone, it has a pharmalogic action relative to testosterone, and it is not classified as an estrogen. The fourth test, for which it has not tested positive, would indicate that andro is anabolic, meaning that it promotes muscular growth. "No one is arguing that it is a steroid" said Ziegenfuss. "[The government] is just asking if it promotes growth-if it's anabolic." The anabolic determination will lead to some sort of government intervention. It may be confusing to consumers who have andro products at home, and to manufacturers who have been lawfully selling it for years. "Does this mean that if it's on a store shelf, [the retailer] can't sell it anymore? asked Mark Olson, vice president of research and development at Metabolic Response Modifiers (MRM). "Or does that mean if you have it in the kitchen, you're supposed to dispose of it, otherwise [the police] can come into your house and arrest you?" Olson reported that in his last call to the FDA, the agency told him it is maintaining a "hands off" attitude toward andro. Through the Food and Drug Administration (FDA) has been regulating the sales of andro, the issue has recently been handed over to a division of the Drug Enforcement Agency (DEA).